"Primetime" Paul Roberts...Take a look at Greatness! Won National Championship at first PPV in only 7 professional matches; World Championship in only 11. Defeated Hall of Fame wrestler Mike "DDay" Carnage in first World Title defense. Match with Carnage was voted Match of the Year by peers. Recruited and created the group WCF: Revolution to feud with the DSW roster. Forfeited WCF World Title to become an active member of WCF Management as Vice President of Opperations. Won the UWF Universal Championship in only four matches. Won the ASW X-Championship in only three matches, in ASW's first ever Ultimate X match. The Official Web site of the greatest of all time! Just so no one is confused I am the one on the right. The beautiful girl in the picture is none other than my bride Bridget. 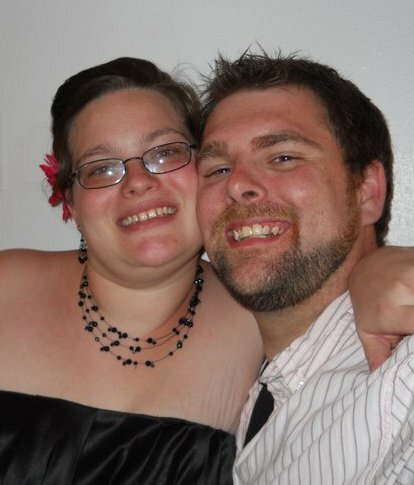 We were high school sweethearts since sophomore year and we got married September 4th 2004 after we both graduated from high school. But I want to get to the mind behind “Primetime”. Born on June 28th 1986, as Paul Robert Huber in Tulsa Oklahoma, grew up most of my years in Ellendale, ND graduated and got married in 2004, I'm happily married with three girls, Aundrea, Trinity, and Zequira. I got into fedding near the end of my high school career, when I was introduced to it by my brother and close friend Trev. “Primetime” Paul Roberts was not the first character that I used although he was the first I ever actually was officially booked as. My first character was the underachieving Apple Bob. A character spawned from the then major push of the WWE star Eugene. I however designed Apple Bob to be an underachieving star who did not need to be successful to work; seeing as how my role-playing skills were that of an early novice. However, I dropped out of the NEWF before Apple Bob was ever booked in a match because of disputes with the owner over how the character was to be handled. From there I backed away from E-feding for a while; not being able to find a fed that suited me very well. Eventually I came across the E-Fed Global Championship Wrestling (GCW), but I had since stepped away from the Apple Bob character deciding that I wanted to build a legacy in E-Feding. “Primetime” Paul Roberts was created to be a character more based towards me to give me something to build on. However like the NEWF before it I left the GCW before ever being officially booked in a match, due to moving complications that would leave me without internet for a while. When I returned to the GCW I found it closed. “Primetime” Paul Roberts got his official start in the WCF, the World Championship Federation, and he became my release from real world problems and temporary escape from life that we all need. 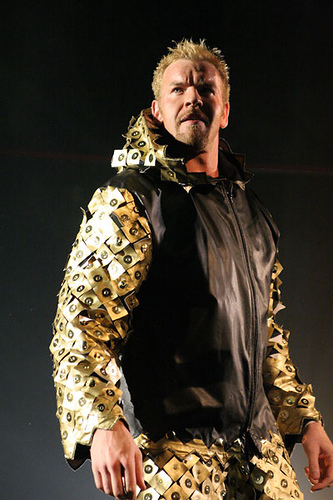 His cocky and arrogant attitude was originally started as a mix of Triple H, JBL, and Randy Orton, but eventually spawned an attitude all his own and began to pull away from the characters he was patterned after and became his own character. Originally Paul Roberts was more of a comic relief character, as I have always used him in real time, but regardless of the fact that Roberts had no proven track record in wrestling, heck he had never even wrestled a match. Nevertheless, he was still as cocky and arrogant as if he had been undefeated for years and years. After a few victories it became apparent to me that if “Primetime” continued to be successful he could be a major influence regardless of the fed I was in. So as Roberts grew as a character I grew as a writer and the role plays got better right along with him. Adding more color, a banner, and eventually his own site, as opposed to just posting in red on the role play boards. I am a true believer that your role-plays are the life of your character so your role-plays should reflect who and what your character is. So the bigger and better Roberts became so did the role-plays he was included in. So when looking in the role-play archive all of the role-plays from his run as WCF National and World Champion can not be found there as I did not start archiving the role-plays until after the WCF has hit its first hiatus. Eventually the character became a mix of all pieces of me, every bit a part of me as the real me. He just happens to be a little over exaggerated and over the top, but that is what wrestling is right? Now don’t get me wrong I don’t walk around talking about how great I am or everything I have accomplished. In fact I am probably the exact opposite of that which is why it flows so well as “Primetime” because it gives me that outlet to do things that I normally would not do in real life. But rest assured anything that I say as “Primetime” is strictly in character and is by no means how I feel as a handler toward anyone. This has been a problem in the past, I can recall a few times where handlers thought I was taking Out of Character pot shots at there characters in role-plays, when all I was doing was merely trying to be the best heel I could possibly be. Which brings me to my next point, some people would argue that “Primetime” Paul Roberts is a heel and not a neutral character as I always say he is when joining a fed. I would argue that Roberts’ attitude does not change at all no matter who he is facing, if he is facing the most beloved character in the fed then yes he would come off as very heel. But think about it this way, if the most hated and cocky character in your fed who had been dominated everyone for a long time was about to face “Primetime” Paul Roberts, and I came out talking about how this guy was not even in my league and how I am going to beat him from pillar to post in our match would you not cheer for "Primetime" to beat the hated heel? I know I would. I love the character “Primetime” Paul Roberts and if I have it my way his legacy is just beginning. For those of you who are interested in knowing more about me, here is the link to my Facebook Page.